I recently inspected a 2009 Phaeton 42QBH at King's Campers in Wausau, WI. Being a new model and showing a great deal of promise, I gave it a very thorough inspection and took lots of pictures. I'm posting this so that the TiffinRVNetwork members can see some pictures and descriptions of this great coach. 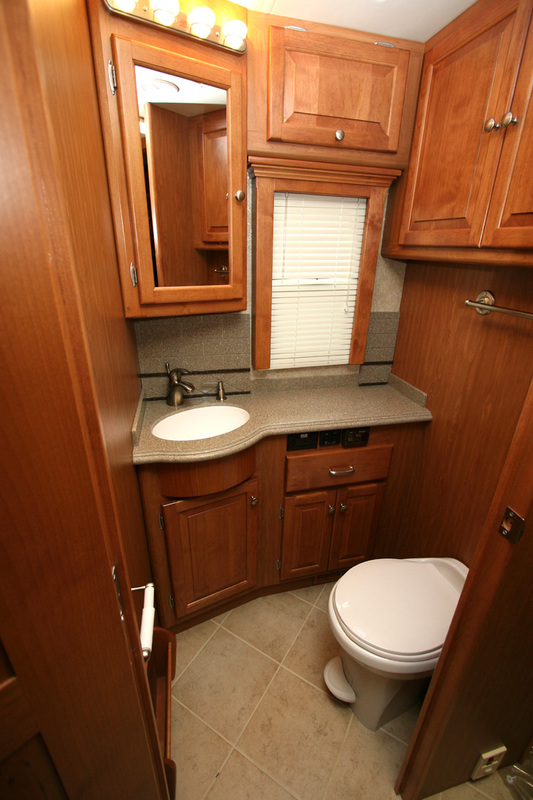 The 42QBH is a new product in the 2009 model year Tiffin lineup. It marks the introduction of a totally new floor plan concept in that it has a rear bath. Normally baths are located mid-ship so that the commode can be placed directly over the black tank. The 42QBH still has that mid-ship commode and sink but the main bath area has been moved to the rear of the coach, immediately aft of the bedroom. A Macerator style toilet has been placed in the rear bath to move any waste forward to the black holding tank. This unit is available on either a Freightliner or Spartan tag axle chassis with rear radiator and 360 HP Cummins ISC series engine. 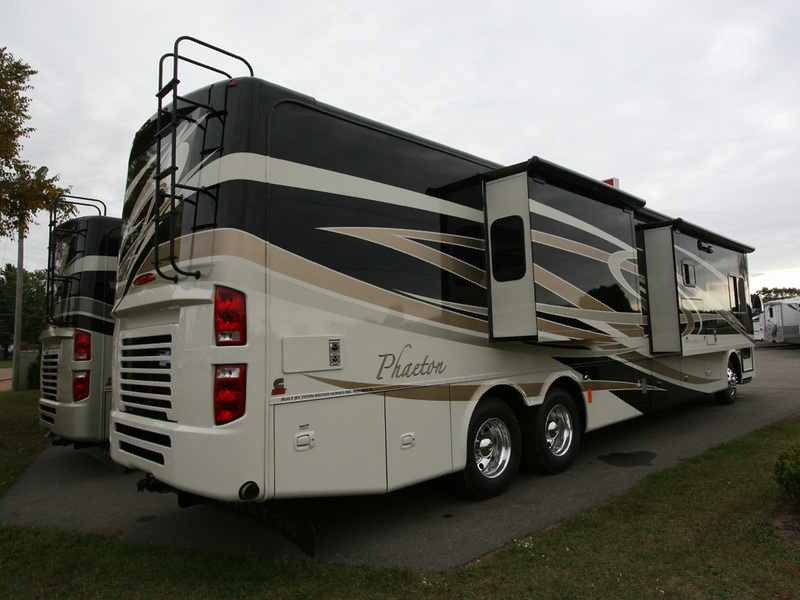 The Phaeton has been setting industry sales records, unusual for a class A motorhome in an industry that is presently in a downturn. But, after viewing the features, decor, and quality build of this coach many buyers are finding the Phaeton to be the best buy around in a diesel pusher. I tend to agree. The coach I looked at had a MSRP sticker price of $285,782 and was fully loaded. That puts a typical net sale price in the mid $220K range, which is a great value for a 42' tag axle coach with all of the features of the 42QBH. The 42QBH that I viewed had just arrived from Red Bay the morning that I was there so my pictures reflect a coach that's been not yet been prepped for display because Kings didn't get a chance to clean it up yet. I have to admit that Leann and I had our suspicions about this floor plan. Initially we felt it would be waste of space and had some pre-conceptions prior to looking at it. However, once we looked everything over we were very pleased and felt that this was a floor plan we wouldn't mind having. 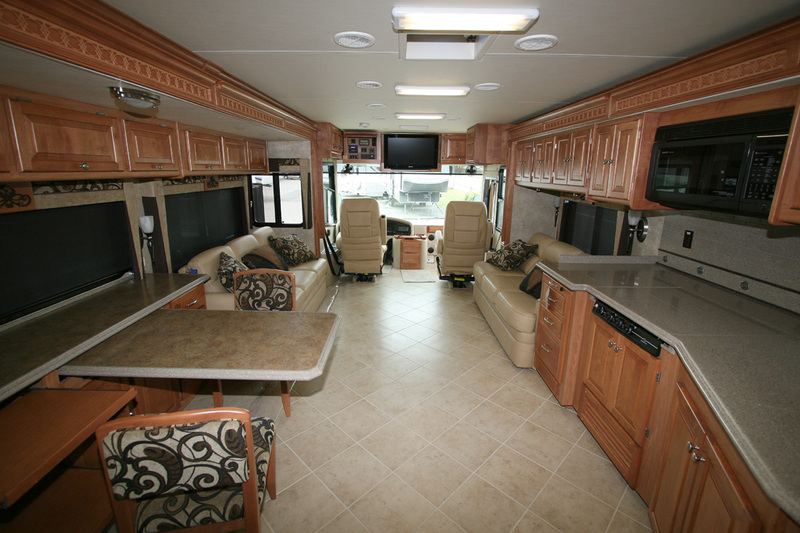 The 42QBH that I viewed at King's Campers was in the Gold Coral full body paint color scheme. The 2009 Phaeton paint scheme, as usual, is very flattering and has a very high end appearance to it. The above images show some of the features. This quad slide Phaeton is equipped with aluminum wheels, chrome mirrors, full body paint, Hadley air horns, side view cameras, and both patio and entry door awnings. This year Tiffin has gone to black anodized rear ladders versus the previous bright polished aluminum to help the ladder integrate more cleanly with the coach's decor. DynaShield protective paint film helps protect the front cap from stone chips and a 10,000 watt Onan Quiet Diesel generator set provides plenty of power to run the three rooftop air conditioners as well as anything else in the coach. Barely visible in the top image is a 32" LCD TV located in the front most curbside slide out. Raising this weatherproof access panel exposes the TV for any outside entertainment you may have going and also acts as a sun shade for the TV. This high location makes for easier viewing compared to the lower basement location used by most other manufacturers. This unit came with a special Spartan Mountain Master tag axle chassis that was designed for this coach. It features a GVWR of 42,600 lbs, and the weight placard on this model showed a generous cargo carrying capacity of 10,205 lbs. That should be enough to haul anything that you could possible fit into the cavernous basement storage are and the numerous cabinets in the coach's interior and further illustrates that the rear bath design does not add significant weight to a coach. The chassis uses the 360 HP Cummins ISC engine and Allison 3000 transmission. The solid front axle has a 12,600 lb rating and is separated from the rear axle by a 296" wheelbase. The rear axle is rated at 20,000 lbs and the tag axle is rated at another 10,000 lbs. 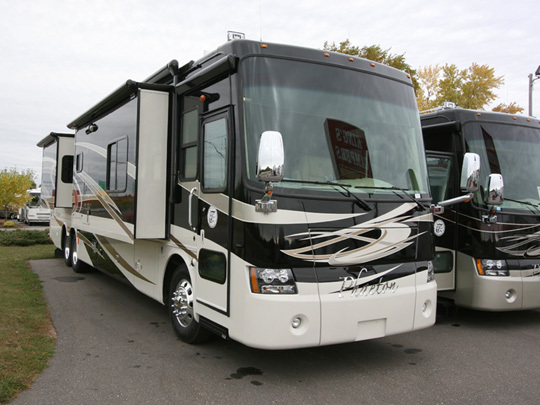 The 360 ISC features an extremely wide rpm range where torque is maximized and you'll find that the 1,050 ft-lbs of torque is enough to haul this coach over any mountain pass that you'll ever encounter. To help control speed on the downgrades, a true engine compression brake is utilized rather than an exhaust brake. This greatly increases the engine braking capability of the 42QBH. A 55 degree wheel cut further ensures that you'll be able to maneuver this coach into tight quarters with ease. 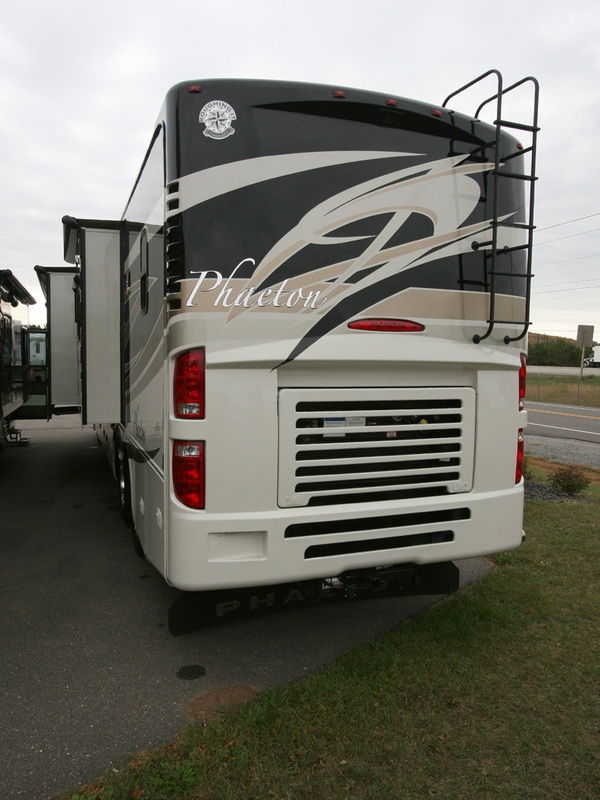 A spec sheet on this particular chassis is available on the RV Tech Library at www.rvtechlibrary.com/chassis/spartan2008_42phaeton.pdf. Technically, it's a 2008 spec sheet, but it's the same as 2009. The 2009 Phaeton 42QBH interior features full ceramic tile. This particular coach had the Montecito interior with Medium Alderwood Cabinets. It strikes a nice balance between mild and wild and adds a touch of class. This rearward view shows the dual 74" couches and looks back into the bedroom. The passenger side couch was an air-coil sofa sleeper that uses an air mattress to fold out into a bed while the driver side couch is a DE sofa sleeper that folds out mechanically to create additional sleeping area. This forward looking view provides another look at the salon area. While a mid-ship 32" LCD TV is standard, this coach also features and overhead 32" LCD TV in the cockpit area. The Flexsteel captain's chairs are also finished in Ultra-leather. Rather than duplicate things, if you want detailed information on features not shown here, feel free to view a previous review on the 2007 Phaeton 42QRH that I've placed on this site earlier. There really weren't that many changes of significance so for this review I'll concentrate on the unique layout of the 42QBH rear bath floor plan. This coach does indeed have all of the features common to the rest of the Phaeton line. 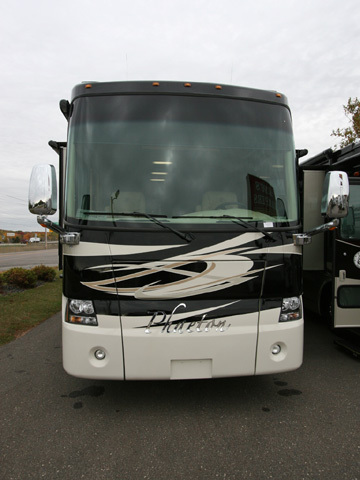 This particular coach did come with the Kingdome in-motion satellite dish, Panasonic in-dash radio with GPS navigation system, Hadley air horns, central vacuum cleaner, 32" exterior LCD TV, in-dash navigation system, basement cargo slide tray, etc. 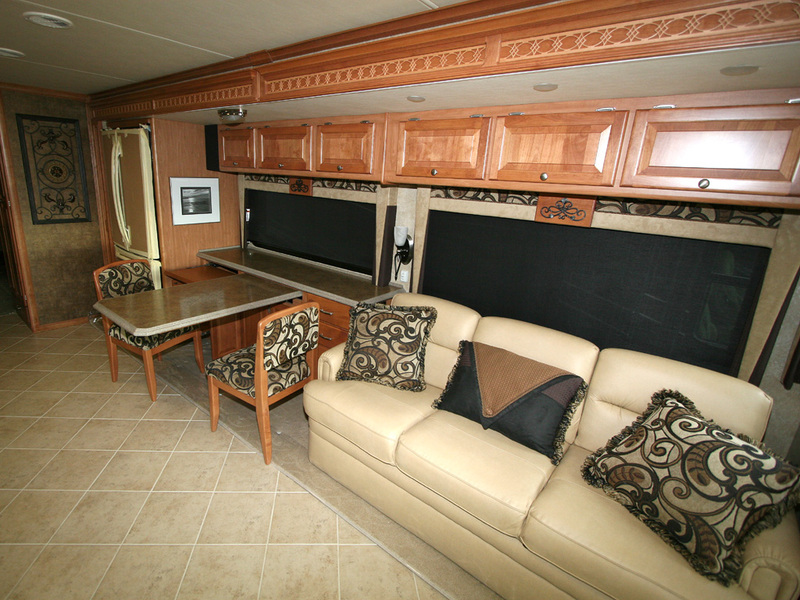 This overview of the driver's side shows the dinette and surrounding area. The DE sofa sleeper couch is finished in Ultra Leather and folds out into a sofa bed for additional sleeping room. 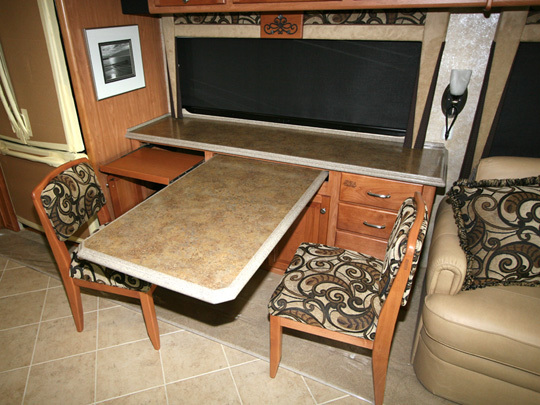 The dinette table is actually the computer desk version, which features a legless table so that you won't be kicking your toes on a support leg when entering or exiting the dinette. 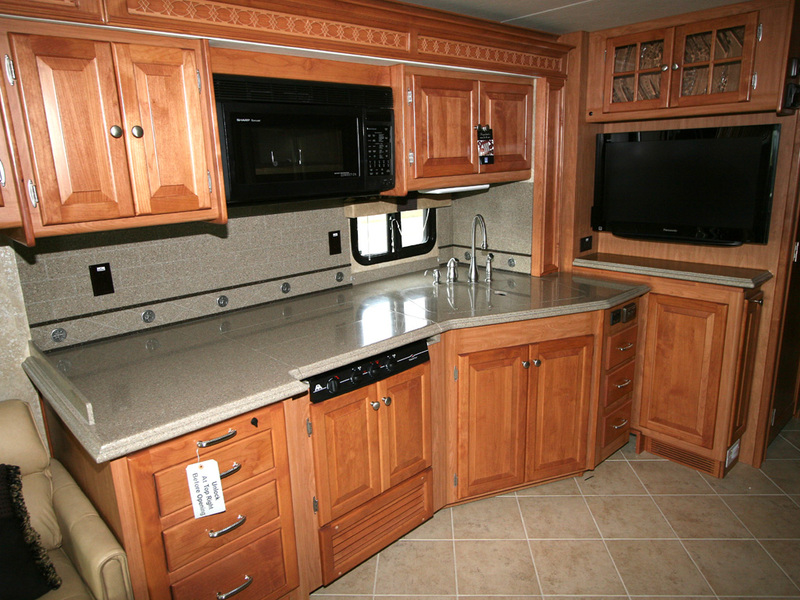 The spacious cabinets and extra wide buffet top provide even more valuable storage and counter space. The 21 cu ft refrigerator is a large Maytag residential fridge. It features a large pull-out freezer door at the bottom and two side by side doors to expose the upper refrigerator area. The refrigerator is trimmed in stainless steel but this coach had just arrived so it was still covered with the protective cardboard covering and masking tape because the dealer had not yet had the time to clean it up. This unit is powered by a 3,000 watt true sine wave inverter to ensure continuous operation under any power conditions. Additional batteries are included so dry camping with this unit is not a problem. Also note that the refrigerator is included in the main slideout, further increasing available floor space when the slide is extended. These close-ups better show the features of the computer desk design. 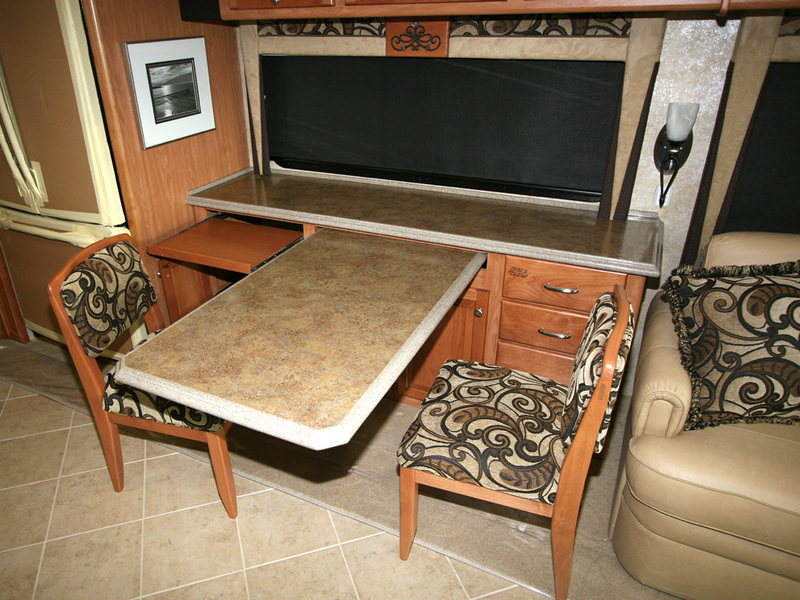 The sliding dinette table is trimmed with solid surface edging as is the very wide back buffet area. 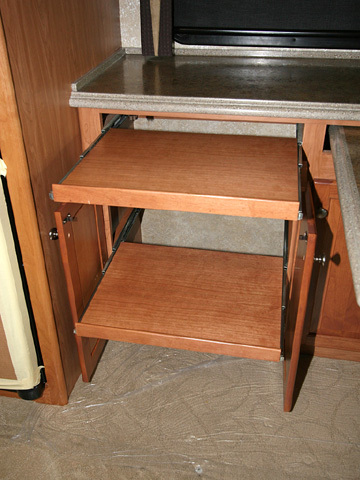 There is extensive cabinetry built into this unit and the bottom-right drawer is actually a file cabinet drawer with racks for hanging file folders should you desire to use it in that manner. On the left side the doors expose two slide-out shelves. The upper can be used to store a laptop or a keyboard while the bottom is perfect for a printer. The galley features solid surface counter tops. This particular coach had a 3 burner gas cooktop but it is also available with an oven. A Sharp microwave/convection oven is located in the overhead cabinetry. 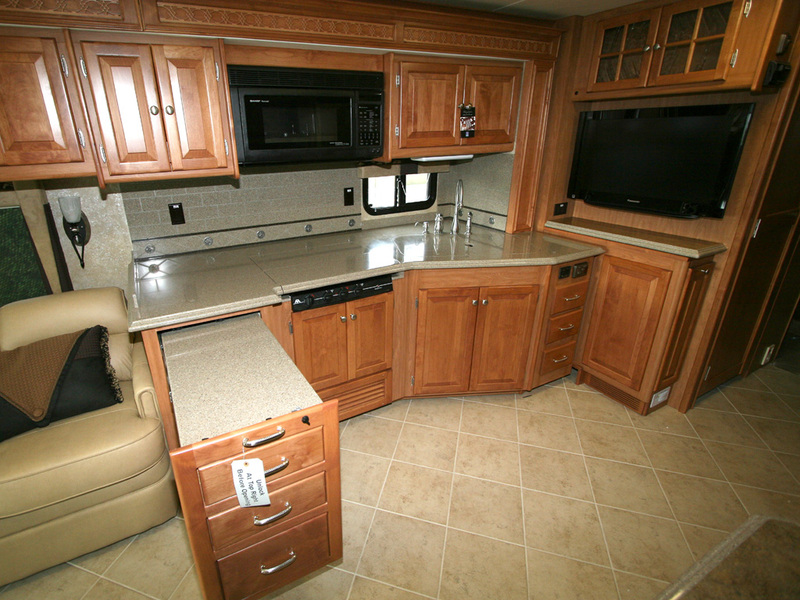 The standard 32" LCD TV can be seen in the hutch to the right of the galley. 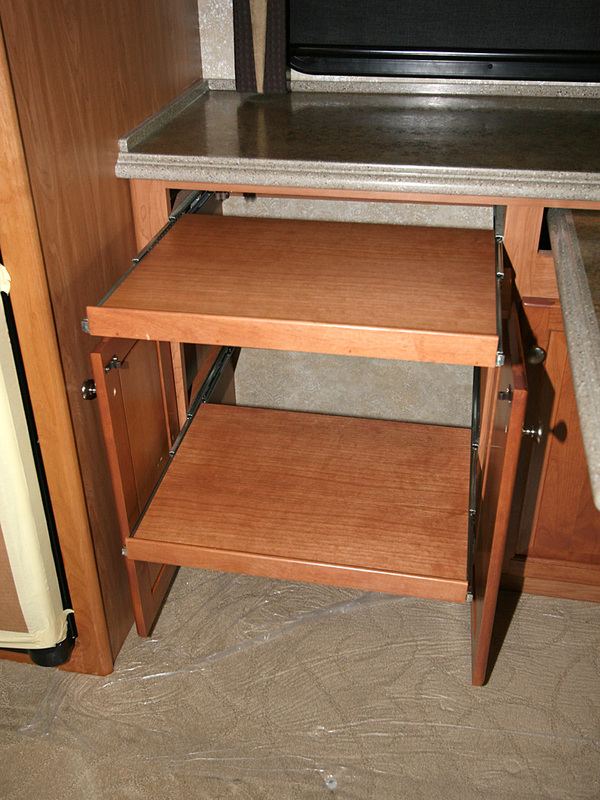 A very handy feature is the pullout cabinet and workstation. Whenever you need more work area simply extend this cabinet to provide and additional solid surface work area. The cabinet assembly easily extends and the full depth drawer can still be opened when the galley extension is in fully extended. 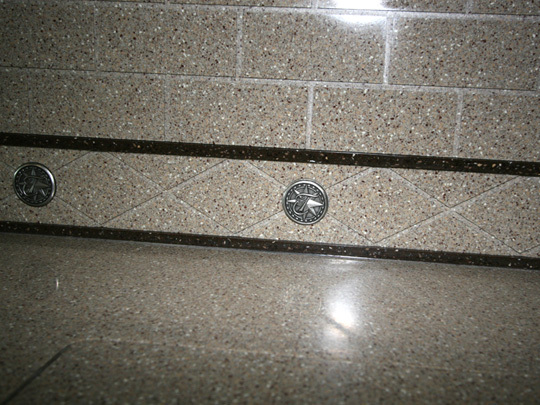 The backsplash used on the galley countertop is an engraved solid surface design that matches the counter top. Linear inserts and pewter Tiffin rosettes are inlaid into the material. 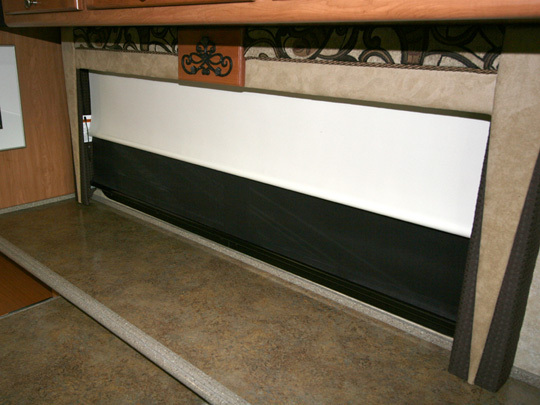 For 2009 the Phaeton uses RollEase shades in the living area of the coach. This two roller design features a solid white privacy shade for night and a solar mesh shade for daytime sunlight control. These shades are operated by handy roller pull chains tucked into the valance. 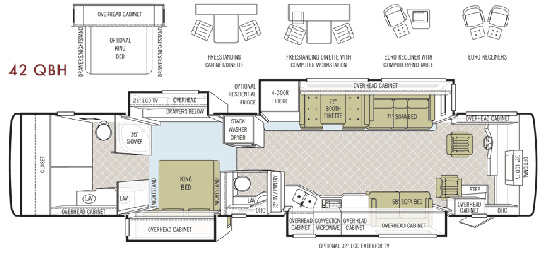 The mid-ship area is here you'd typically find the bath area on a conventional floor plan. 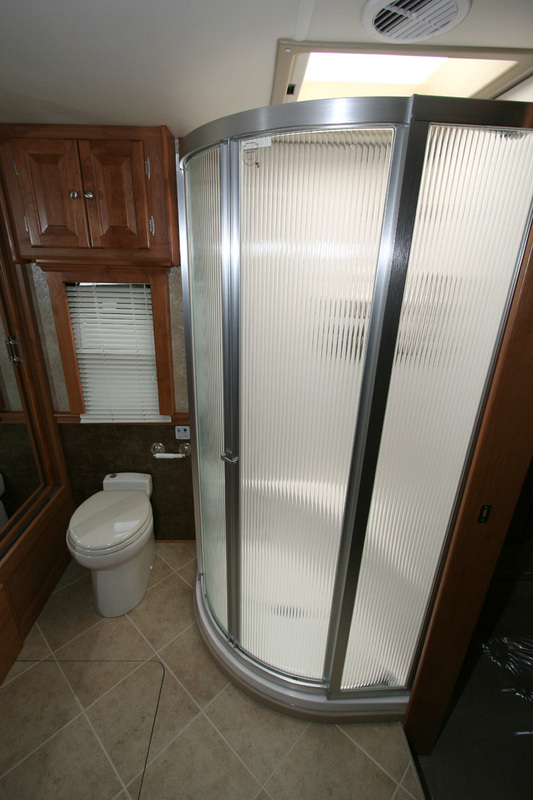 Because the bath area was relocated to the rear of the coach, this area was redesigned. There is a separate water closet room with a toilet, sink, and vanity. That'll be more than adequate for any guests and won't require a trip through the bedroom to get to the main rear bath. Solid surface counter tops, a mirrored medicine cabinet and Fantastic exhaust fan finish off this room. Opposite the hall is a large wardrobe cabinet. This location can be configured in one of three ways. As shown here, it provides massive storage area for linens or whatever else you may want to place on the shelving. If you order the Splendide 2100 combo washer-dryer, it will be placed in the lower half of this cabinet, still giving you the upper half for shelving. If you order the stackable washer-dryer units then there will be no shelving because these two units will fill this cabinet. 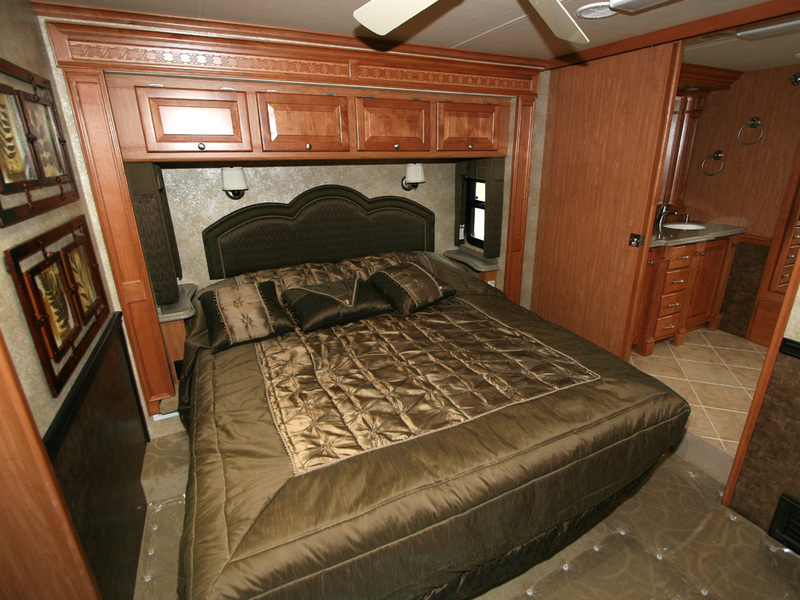 This overview of the bedroom area shows the king bed, which is located in the passenger side slideout. Because the bedroom is no longer at the extreme rear of the coach, there is no engine hump to step over on one side of the bed. The flat floor continues to the rear bath, shown at the right of this image. 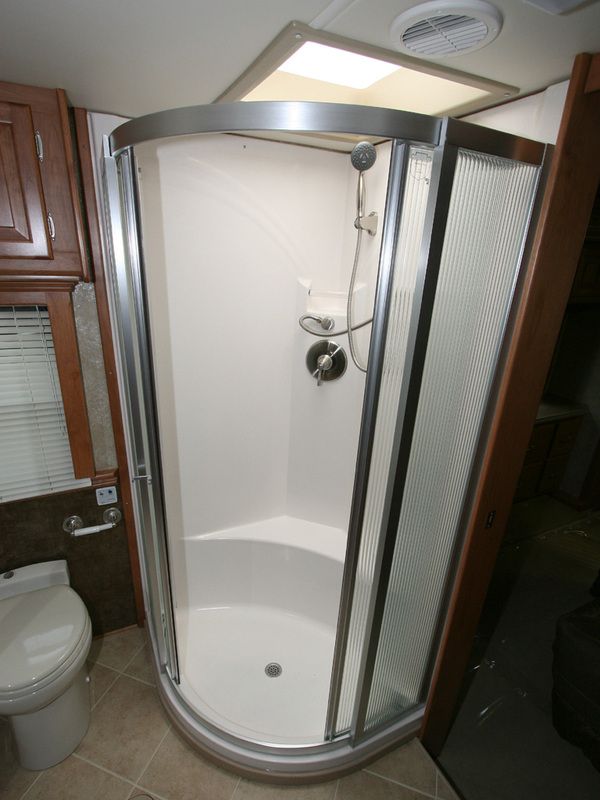 As you enter the rear bath, there is a small step up to allow for clearance over the engine. This step is visible in this image. This coach is available with a queen bed as well. In that case you'll have a bit more floor space around the bed and wider end tables and drawers. A ceiling fan is standard in the 2009 Phaeton. 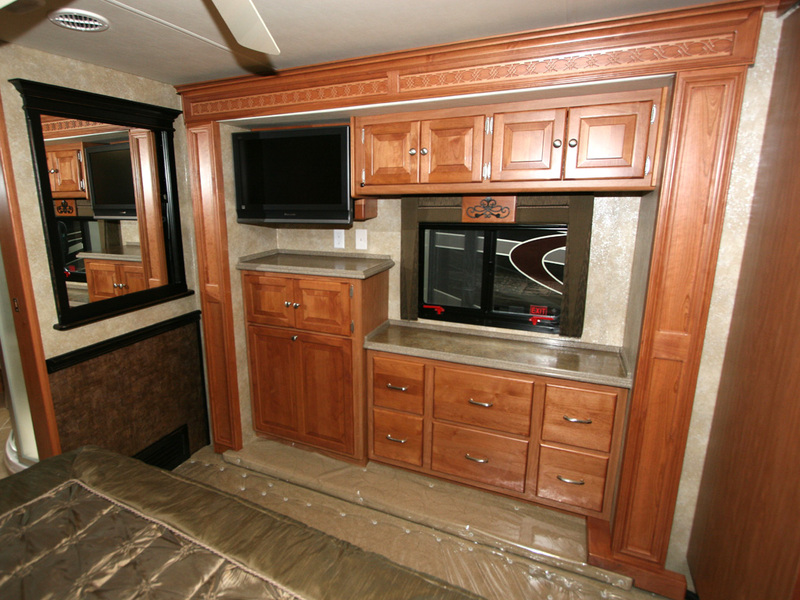 Directly opposite the bed, on the driver side, is the LCD TV and dresser cabinetry. A large pull-out laundry hamper is located at the left-bottom and cabinets directly above it are wired for DVD players, satellite receivers, etc. Entering the rear bath from the bedroom, this is the view you'll see. 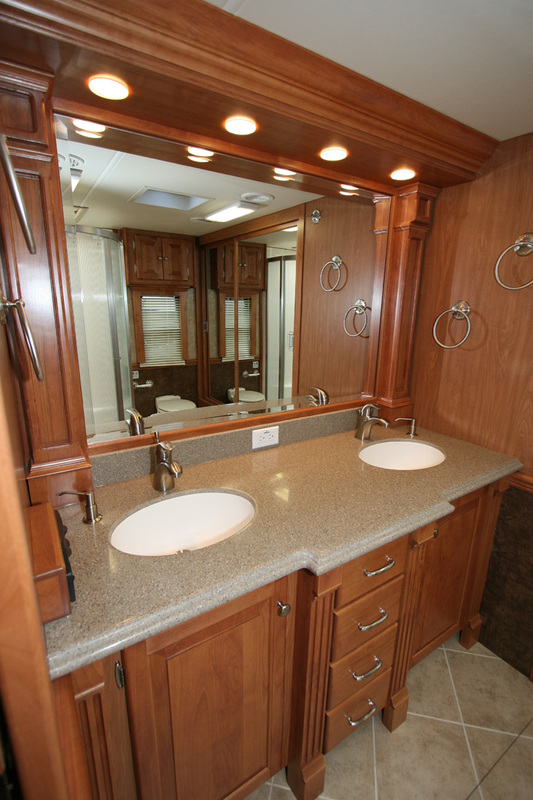 The passenger side of the bath features a large solid surfaced vanity counter with dual sinks. above the rear backslash is an expansive mirror, surrounded by tile hangers and other hardware. 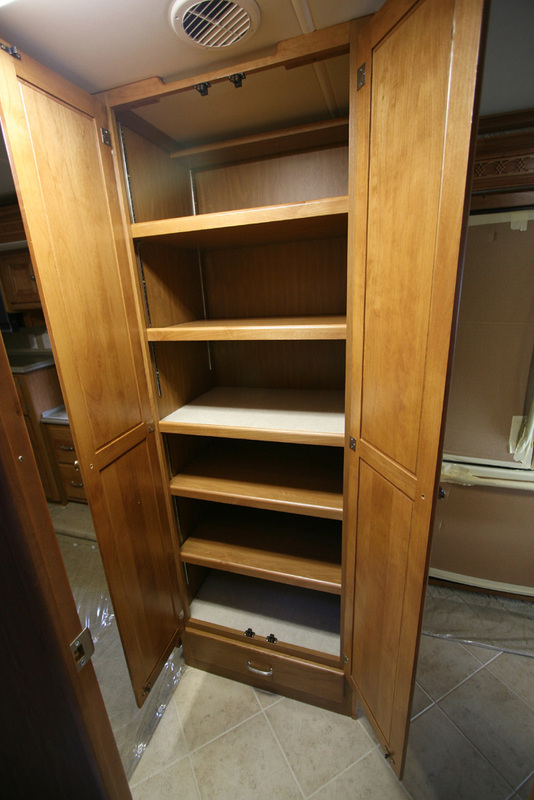 To the very rear of the coach is a full width wardrobe with sliding mirrored doors. 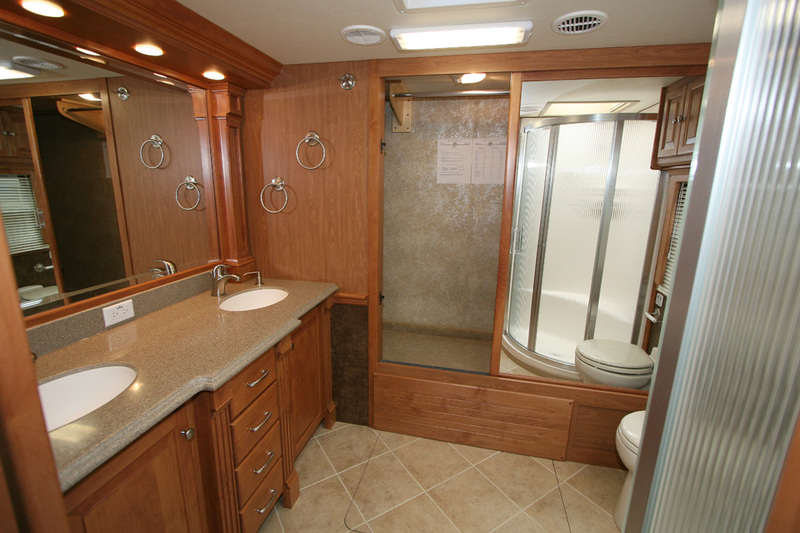 On the driver side is the shower and toilet. This close-up of the vanity better shows it's features. These views show the more details of the driver's side of the bath. The toilet and window can be seen to the left of the shower. The circular shower door slides in a track rather than hinged so there'll be no more shower doors dripping water on the floor when you exit the shower. Not very well shown in this picture is the shower skylight, which features a sliding sun shield that easily slide to cover the skylight to eliminate solar energy from heating thing up on those hot, sunny days. Normally an RV toilet is positioned directly over the black holding tank and uses gravity to transfer waste to that tank. 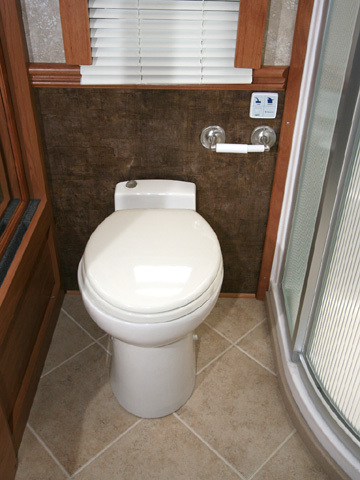 On a rear bath that's just not possible so a Macerator style toilet was used, similar to marine applications. The Macerator acts as a garbage disposal unit and pumps it forward to the black holding tank. The control pad on the wall controls these functions. This shot, taken from inside the full width closet shows the AC breaker panel and DC fuse panel location. It no longer takes up valuable closet space and is located at the far curbside end of the wardrobe, off to the side and not in front of any open door. This closet design is unparalleled in any coach and if you can't find enough room to hang all of your clothing in here, then you have too much clothing. 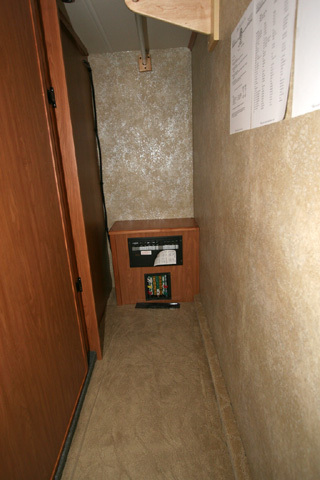 At the far driver side of the wardrobe is a small hatch built into the floor. 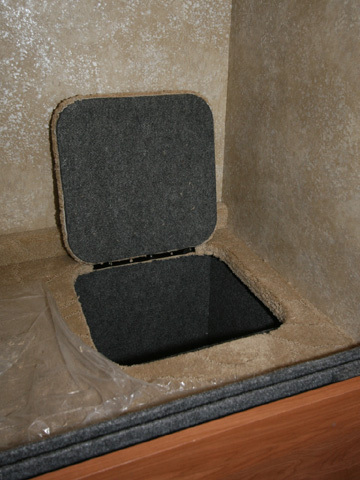 This hatch accesses another hidden storage compartment underneath the floor of the wardrobe. With a bit of clever camouflage this can become a hidden storage area. 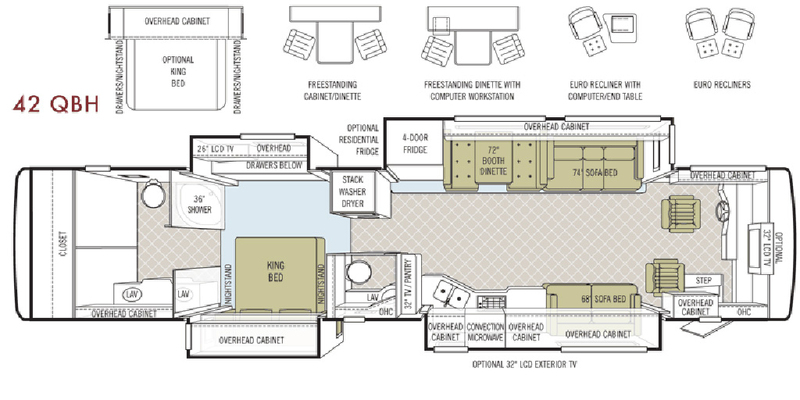 The 2009 Phaeton 42QBH is a new direction in floor plans. Our initial preconceptions were unfounded. We felt that a rear bath was going to take up too much space in the coach and make for an unlivable floor plan. However, now that we've seen this unit we are quite impressed. The large wardrobe has more than adequate space and any changing or dressing will be done in the rear bath. Even so, the bedroom does have quite a few drawers and cabinets so it really didn't lose anything. 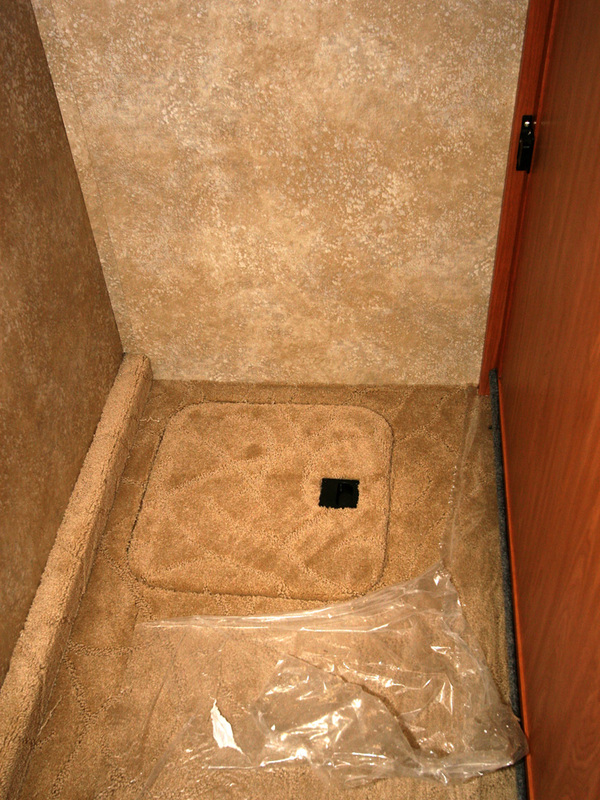 The mid-ship toilet room still provides a place for guests to access the sink or toilet while allocating the privacy of the rear bath to the master bedroom. The galley is adequate and functional and there's enough LCD TVs in this coach to open up a TV store. 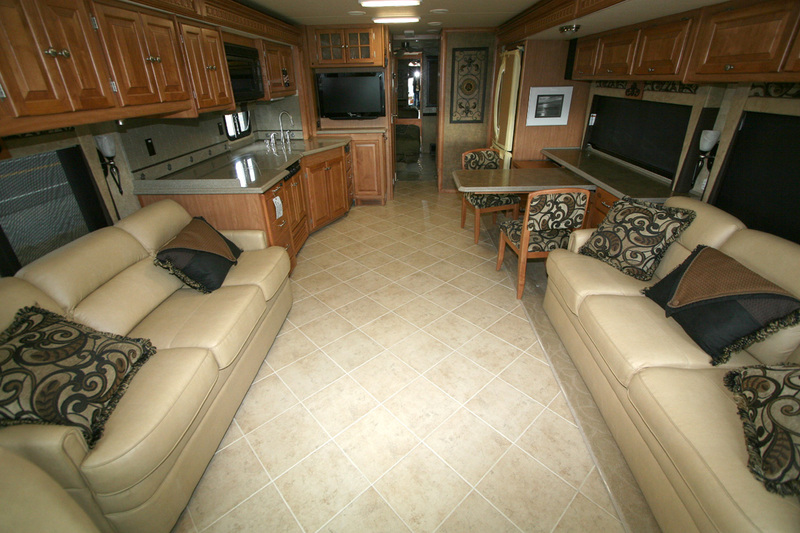 Dual 74" couches provide plenty of seating room and the computer desk/dinette truly makes this a multi-functional area. If you don't want to use this for a computer, the expansive cabinetry provides plenty of room for storage of galley related items. And the extra wide side buffet really adds room to the dinette table and can be used to place serving dishes or just as a place to put pictures or other decorative items. This coach has more than enough power to move it down the road and with over 10K of cargo carrying capacity you can haul virtually anything that'll fit in the coach. In short, this floor plan really works and it's something we wouldn't mind having. Tiffin did an amazing job of putting this together without the usual compromises that come between the various areas when creating a new floor plan.